Fantastic news – and yet another affirmation of their rapidly burgeoning reputation – as BBC Radio 1 have announced that they’ve picked MDNGHT to perform at one of the most sought-after events in the UK, Radio 1’s Big Weekend on Sunday 25th May. It means they will be sharing the bill with huge stars like Katy Perry, Kasabian and Rita Ora amongst many others. The band are part of a select few artists identified by the key tastemakers in the BBC Introducing team, marking them as one of the UK’s hottest prospects. 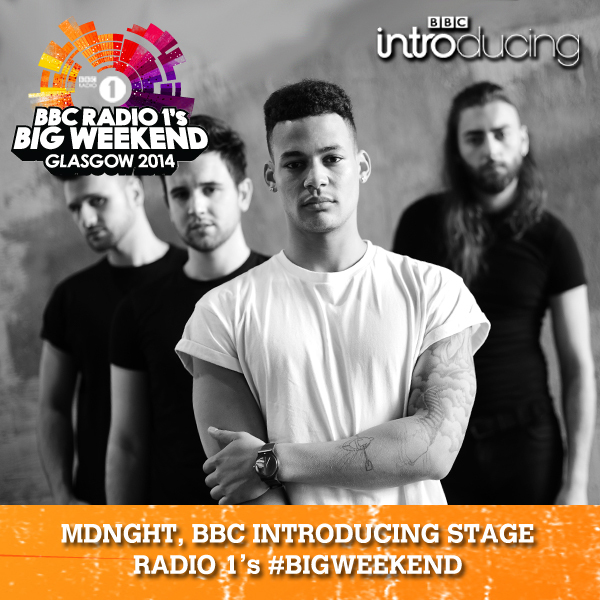 MDNGHT will be playing the BBC Introducing Stage alongside other highly-sought-after new acts, including Catfish and the Bottlemen, Royal Blood and XO. There’s full information on the Big Weekend here – which takes place from the 23rd to the 25th May. Posted on by admin. This entry was posted in BREAKING NEWS and tagged BBBC Radio1 Big Weekend, BBC Introducing, BBC Radio 1, BBC Radio1, Big Weekend, Catfish and the Bottlemen, Kasabian, Katy Perry, MDNGHT, Radio1, Rita Ora, Royal Blood, XO. Bookmark the permalink.